BELIZE CITY, Mon. 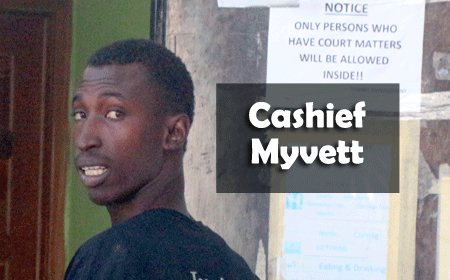 Nov. 6, 2017–Cashief Myvett, 25, who allegedly stole a wallet containing $35 by the use of force, was charged with robbery when he appeared today before Senior Magistrate Aretha Ford. Myvett pleaded not guilty to the charge. The prosecutor objected to bail on the ground that the offence has become prevalent. When Senior Magistrate Ford asked Myvett to give a reason why he should be granted bail, he remained silent. Senior Magistrate Ford upheld the objection and she remanded Myvett into custody until January 31. The incident for which Myvett was charged, occurred on Saturday, November 4. The complainant, Arturo Cawich reported to the police that he was sleeping on a bench at the bus stop on the Philip Goldson Highway in front of Pallotti High School when he was awakened by someone fumbling with the back pocket of his pants. He said he began to struggle with the man, but the man was too strong for him and managed to take his wallet, which contained $35. The culprit, he said, then ran across the highway in the direction of San Cas Plaza. Police, however, were in the area and they quickly apprehended Myvett and retrieved Cawich’s wallet with the money in it. Police reported that Cawich positively identified Myvett as the person who robbed him.